Mangaluru, Jan 6, 2017: 450 years - 1568-2018 AD Christianity is ever present in Kanara - The Church of Mangaluru is holding a Eucharistic Rally on Jan 7, 2018 to inaugurate this event and declare 2018 as the ’year of the Rosary’. "Mangalore Today" has published a special feature with the detailed history in it’s Dec 2017 issue. In parts of present Karnataka - Mangaluru and Udupi in particular, officially Christianity has been part of the culture as per records, from 1568AD. This year 2018 accounts for 450 years.The influence wielded by various entities has surely influenced visibly, early clergy even until early 1900s was predominantly European - Italian and German, and their introduction of education provided the winds of change. Mangaluru has been a cradle of education for last 150 years or more. Now, Church in Mangaluru has declared 2018 as the year of the Rosary and will focus on Rosario Cathedral as the apex and Christianity in Tulunad. Christianity first came to India within 20 years of Jesus Christ’s death at the age of 33 years, so to say in about 52.AD; thus it came to the Indian sub-continent even before it was known in many western countries. It was Christ’s close apostle one of the first twelve, St.Thomas, from Syria came over the Arabian sea, and landed in the extreme south of the West coast of India, what is now Kerala. 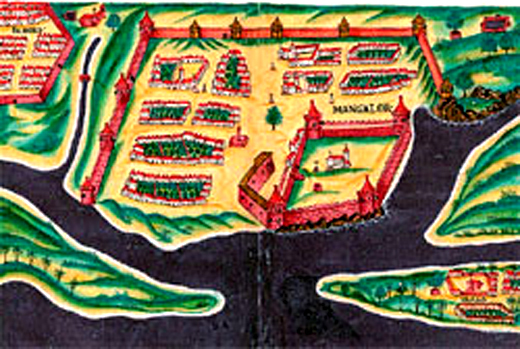 Centuries later, the Portugese touched Mangalore in 1530s, it took much effort to finally land on Mangaluru soil on January 5, 1568 in a trading pact with Tuluva rulers who gave space on the banks of river Nethravathi in the area now known as ’Halaya Kote’ in Bolar. Records indicate, Portuguese garrison consisted of not less than 200 men, the then Portuguese fort was named ’Sao Sabastiao’ (St.Sebastian). Reluctant converts to Christianity ’Sarasvats’ of Konkani origins from Goa, originally from the banks of the extinct river "Saraswathi", were brought here to work in the spice mills and agricultural lands. They were the early Christian population here who were later joined by mainly Konkani migrants who had reached Farangipete independently decades earlier. Within the fort was a settlement and small chapel, ’Nossa Senora de Rosario’, (Mother of the Rosary) that served the garrison. By the time of Pietro Della Valle’s visit in 1623, two more primitive chapels, served by Franciscan padres came up beyond the fort he notes. The first ’Rosario’ came to be known as the ’poyada ingreji’ (Tulu) or ’church on the sands’, and also ’factory church’ of the Portuguese. 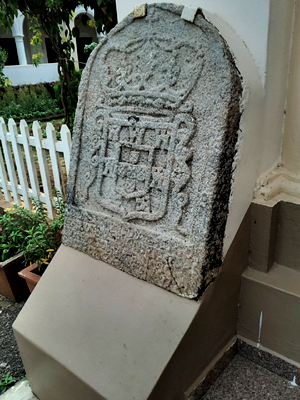 The memory of the Portuguese fort, however, lives on in the name given to the area ‘haleye kote,’(old fort) used even today. Much development has no doubt resulted in the area of the small original Mangaluru town that once lay between "Sharavu Ganapati" Temple just inside Kodialbail and "Mangaladevi" Temple in Bolar; the deity here has given this place it’s name "Mangala-uru", so Mangalore. 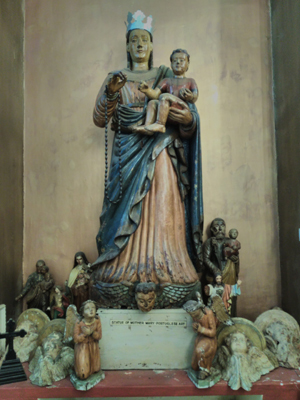 The Roman Catholic faith in it’s present form took root in Mangalore from emigrant Konkani folk in the Potugese settlement around the commodity factories set up around the spot of the Portugese fort of St.Sebastian. The Konkani Catholics faced many trials and were grossly reduced in numbers by the advent of the ’Captivity’ under Tipu Sultan which ended in 1799; the faith stabilized in the 1800s and spread in all directions with many churches established and parishes formed - Kanara Vicarate was established by in December 1845 under Bishop Bernadine as Vicar Apostolic. Pope Leo XIII initiating a decree to set up a hierarchy in India and Mangalore became an independent Catholic diocese on January 25, 1887. The times 1800 to 1915, was a time of struggle and strife with wars, plague and economic poverty yet the Catholic Community rose up like an albatross from the ashes. The Diocese of Mangalore is a dynamic and well organized integral part of the Universal Roman Catholic Church, Rosario Cathedral is it’s ’Mother Parish and Church’. In July 2012, the large active Mangalore diocese was bifurcated to form Udupi diocese, with the Kallianpur church declared as it’s Cathedral. Moves underway to bring in changes in Church matters universally under the guidance of Pope Francis and the Roman Curia. Mangalore Diocese: At present is spread over an area of 5,924 sq.kms (2287 sq miles). with the Catholic population being 2.7 lakhs that is near 9 per cent of the total population in 115 parishes. It is considered the one institution that has kept Konkani as a language flourishing. The clergy/priests within it’s ambit are estimated to be 300 plus. Religious women/nuns now touches the 2000 mark in various dispensations. Further numbers of priests and nuns can be found serving other parts of the country and overseas. The entire region has benefited from this singular entity that stands in the name of God. 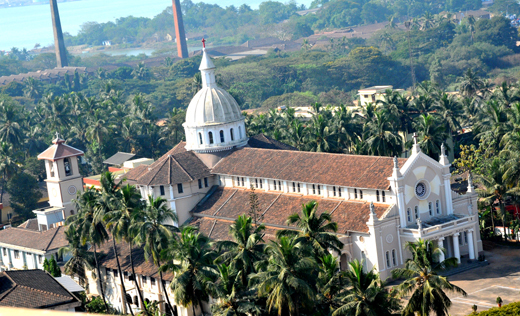 The Diocese of Mangalore since 1887 for 130 years now gone by, has shown a remarkable upward trajectory in all spheres. The present Rosario Church was restored in the year 1813 in it’s present spot after the captivity and raised to the status of a ‘Cathedral’ in 1850, in 1915 the present edifice was completed and opened. 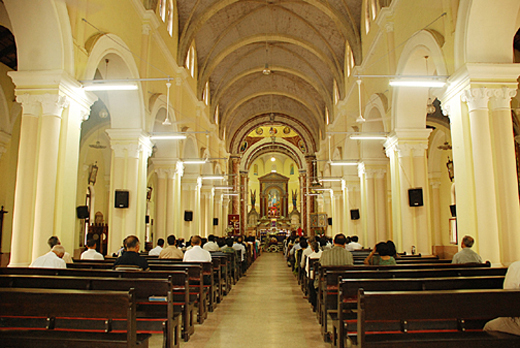 Later a good number of Catholic churches and institutions flourish in Mangalore; The origins and development of the greater Mangalore Diocese (of which Udupi was part before 2012) and birth of many parishes stems from Rosario Cathedral. Pope John Paul II, set foot on the soil of Mangalore diocese on February 6, 1986 - the only time a Pope has visited here. Rosario Cathedral: The inscription seen above the main entrance pillars and portico reads “1568 – Queen of the Rosary Bless India – 1915”. Basically this indicates, the first ever church of the area was established in 1568; the Cathedral is the mother church of the Diocese and seat of the Bishop. The present edifice was blessed in 1915. In year 2008, it’s inside look and surroundings have been given an aesthetic face lift. The Catholic Church and particularly the local faithful certainly have good reason to look upon this land as hallowed, glorifying and holy. Some peripheral achievements, in the form of institutions located here are : St. Ann’s Convent, Apostolic Carmel (AC) Founding Institution -1870, St. Ursula Convent and Foundation House of the Mangalore Ursuline Sisters UFS - 1887. Rosario Education Indtitutions - 1868. and so on. Two great Catholic saints who lived in Rosario that Mangaluru has this good fortune to see two of it’s former religious residents to be declared saints in 2015 are St. Joseph Vaz and St. Mariam Baourdy.